Do you know how to curve text in Cricut Design Space? It’s not hard- just tricky to figure out at first. After doing it once, you’ll never forget how! UPDATE: Cricut Design Space now offers a “Curve Text” icon, making curving text in Cricut Design Space easier than ever! See how here! One night, while late night crafting, I had a shirt project that I was working on that needed curved text. 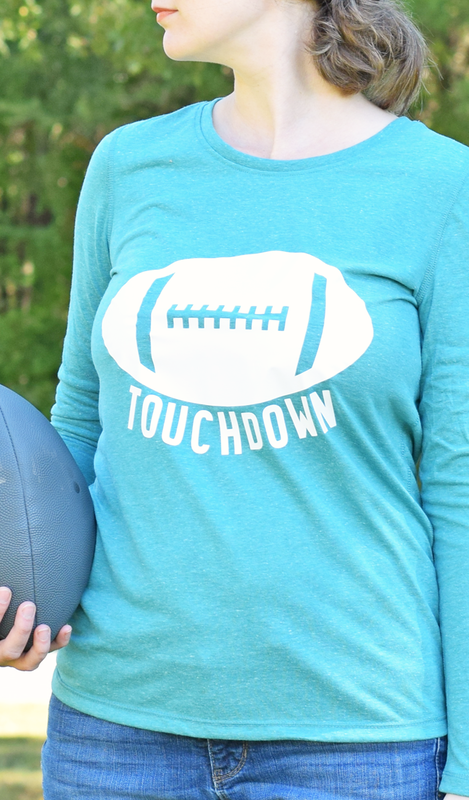 I had been inspired by the Touchdown Sweatshirt over on the Cricut Design Space to design my own Touchdown shirt. I was feeling particularly cheap that night, and I didn’t want to spring the 99 cents for the cut file. Instead, I wanted a football with the word “Touchdown” curved around the bottom. I had never tried curved text before, but within minutes I had the letters just like I wanted. Type the text the way that you want it. In my case, it was the word “TOUCHDOWN.” Go ahead and change the font if you want and then make the word the size that you want it to be. Select the word, and then click “Ungroup.” This will separate all the letters. Look over to the Layers column. If there are two layers to each letter, delete the hidden one so that you only have one layer per letter. Arrange each letter where you want it, and use the curve tool to move each letter where you would like it to be. Once you’re finished, remember to “Attach” the letters back together so that the Cricut Design Space will cut them out together. Here’s the finished project! Do you like it? Check out the full details on the shirt and get my Cricut Design Space link for the cut file! When I was placing text I noticed that each letter had a very faint line. I used that line to arrange letters Helping to keep letters straight. Thank you. I have spent too much time figuring this out and you made it easy. Help. I got a Cricut explore 1 for Christmas. Been trying to make the arched lettering which I can do. EXCEPT when I send it to the mat it is not as I arrange it. It appears it puts it on the mat in a type of paper save mode. Help. Pls. Select each letter that you want to attach together in the layers panel. Then click the “Attach” button at the top of the layers panel. You’ll then notice that all the letters are now together under an “attached layers” heading on the layers panel. I’m clocking the letters but attach doesn’t light up so I can’t click on it. What am I doing wrong? Make sure that you have more than one letter clicked or selected. More than one have to be selected in order for the attach button to light up. You have to hold the shift button down to select more than one letter. Once you have selected all of the letters you want to attach, let the shift button go and you’ll see the attach button light up! Hope this helps! I wish there was an easier of doing this other than moving each letter at a time Sometimes it can still come out crooked. 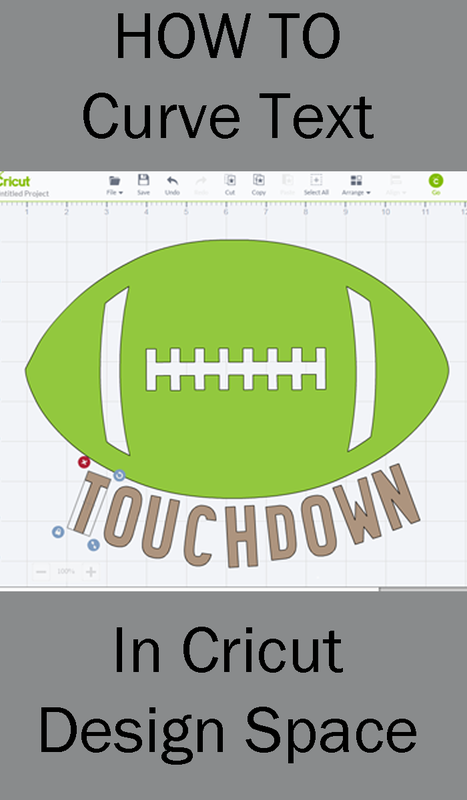 Hi…I have the Cricut Explore Air….am I able to “curve” text with this machine??? I do not have the “curve” nor the curved arrow?? Help!! Thanks!! Hi, I was wondering if you know how to change a letter in a sentence to an image? I want to say Mom, but change the o to a soccer ball? Hi, yes. I would write out the word “MOM” then ungroup the letters. Delete the “o.” Replace it with a soccer ball image of your choosing. Easy peasy pie! Thanks so much! Hi! I’m not quite sure that I understand how you are wanting to make the project, but you can always click the “unlock” button on the bottom left of any image to enable image proportion editing. You could slightly widen the image or lengthen it to fit better on the glass. Placing vinyl on glass isn’t my favorite thing to do because it is tricky to get it lined up just right! Thank you so much for the tutorial.. Now I could figure thing out.. Didn’t know it would be this easy. Help I cannot figure out for the life of me how to get an image that big to cut out on my Cricut I know how to curve but I need a large rectangle but everytime it tells my image too large but it’s smaller than the mat hellllpppp please?!!!!!! Is it smaller but very close to the size of the mat? I’ve had issues if my image was, like, 11.5″. If it is not close, then I would save it, then restart the program. I have the Cricut Air Explore 2 – do I use WELD instead of ATTATCH? Hi, Weld will take two objects that are superimposed. Attach holds the objects in place so that they cannot be moved (or cut) in different places. Attach is still the choice if you are wanting to make sure that the curved text that you have created stays where it is supposed to stay.